Nemadoras leporhinus above, Hemidoras stenopeltis below. According to museum data it’s been recorded from Venezuela, Guyana and Brazil where it inhabits several river systems including the Rio Branco, Rio Orinoco and Rio Essequibo. No precise data is available. Similar species such as Hassar tend to be found in slow-moving tributaries and streams. Fully grown at only 3.2″ (8cm). 24″ x 15″ x 12″ (60cm x 37.5cm x 30cm) – 70 litres. It’s a shy, nocturnal species so it’s best to keep the tank dimly lit. Provide plenty of hiding places in the form of clay flowerpots, lengths of plastic piping, tangles of driftwood etc. It seems to be particularly fond of the latter. Plants aren’t essential but are useful in cutting out the amount of light hitting the bottom of the tank and providing extra cover. A degree of flow in the tank also seems to be appreciated. If you buy one or more of these for your community tank you’ll probably find it will head straight for an area of cover and remain there during the hours of daylight. If you want to see it more often, consider installing a red light above the tank. It can’t see red lightwaves, so if you switch this on at night you should be able to observe it foraging for food. 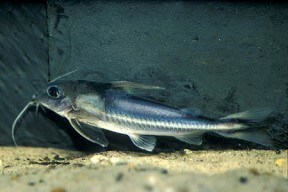 Sinking catfish pellets, algae wafers and other dried foods are usually accepted but live and frozen alternatives should also form a regular part of the diet. Bloodworm seems to be a particular favourite. It’s a good idea to add food to the tank just before lights out to ensure this primarily nocturnal species gets its fair share. While very peaceful, it’s not suitable for every community as it won’t compete well with more active or territorial bottom dwellers. It’s best kept with placid species that inhabit other areas of the tank, such as small to medium-sized characins, cyprinids, anabantoids, livebearers and less-belligerent dwarf cichlids. Corydoras, Brochis and smaller Loricariids are usally ok, too. Like most Doradids, this species occurs in schools in nature and fares better when in the company of its own kind. Buy as many as your tank will comfortably house. If several are present they’ll often share the same refuge during the day. While some jostling for position might occur, no physical damage is usually done. Probably not yet achieved in the hobby. Ther are currently five described species of Nemadoras (N. elongatus, N. hemipeltis, N. humeralis, N. leporhinus and N. trimaculatus). All are rare in the hobby, although this species is the one most commonly seen. As well as the occasional import, it sometimes shows up as bycatch among batches of similar-looking Hassar or Hemidoras species. Of these, it is most often confused with Hemidoras stenopeltis. These two can be easily told apart as N. leporhinus has a clear dorsal fin with a dark patch at the base, whereas H. stenopeltis has a dark tip to the same fin (see image above). 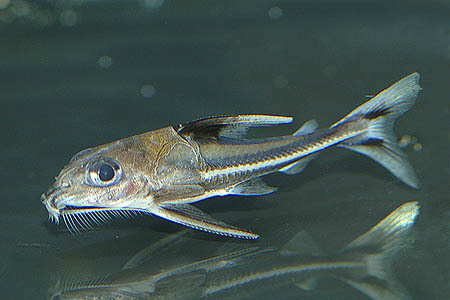 N. leporhinus also has a more rounded snout than its cousin.